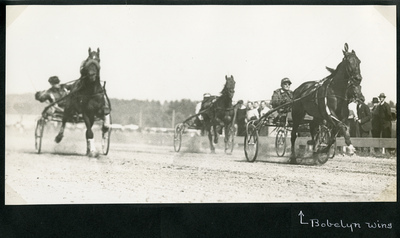 Black and white action photograph of bay gelding Bobelwyn, wearing head number one, Clukey up, winning the first heat of the Classified Trot at the Cumberland Fair, West Cumberland, Maine on Thursday, September 23, 1937. Bay stallion, F.E.W, on the inside (with a white blaze, wearing a shadow roll), Harvey up, finished the heat in second place. Bay stallion, Governor Alex, Gibbons up, finished the race in third place.